How an Uncontested divorce works in California. In California, when a divorce is uncontested, it means that the court is not necessary to make decisions for the couple, because they are able to do it on their own outside of the courtroom. During every California divorce, decisions need to be made regarding the division of property and debts, spousal support, child support, and child custody and visitation. Sometimes, a couple is able to work out the terms of these agreements on their own. Usually, however, it requires the assistance of a professional, whether through a type of alternative dispute resolution, like divorce mediation, or with the help of an attorney. Either way, your divorce can still be uncontested in the court. 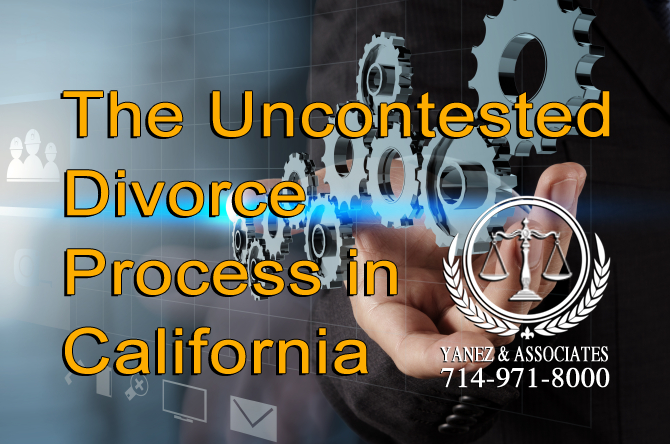 There are three ways that a divorce may be considered uncontested in the California court system based on the initial filing and response. This situation occurs when one party, the petitioner, files the divorce petition, and within 30 days of being served, the other party, the respondent, does not file a response with the court. In this case, the petitioner will likely be granted what he or she asked for in the initial petition. Because the respondent has opted not to be involved in the divorce at all, this situation is a true, uncontested divorce - there is no disagreement about the outcome. The respondent has given up his or her right to be involved in the divorce at all. This situation is similar to a true default in that the respondent does not file a response with the court within 30 days of being served divorce papers by the petitioner. However, it differs in that the two opposing parties have discussed the terms of their divorce outside of the courtroom and come to an agreement regarding their property division, spousal support, child custody and visitation, and child support. Here are some frequently asked questions for our custody lawyers. There are several ways in which they may have found an agreement, but in this situation, the respondent has not given up his or her right to have a say in the divorce because he or she has contacted the petitioner to discuss the outcome. This is an uncontested divorce because the parties do not disagree about the outcome of their divorce. The final type of uncontested divorce happens when the respondent does file a response to the initial petition within 30 days of being served, but the response states that the respondent agrees with the petitioner. Because there is no disagreement, the divorce is uncontested. This type of divorce is common for couples that use a collaborative divorce to work out the issues in their divorce, which allows them to discuss the terms of the divorce before any divorce petition is ever filed. What are some of the Frequently Asked Questions about Uncontested Divorces in California? In California, every divorce is different, and will take a different amount of time. Whether your divorce is contested or uncontested, however, you need to meet the residency requirements for divorcing in California. 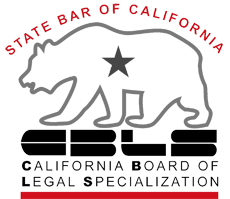 No California divorce may be finalized until at least six months have passed from the date the petition is filed and been personally served on the respondent. In order to get divorced in California, at least one spouse or partner needs to have lived in California for at least the last six months, and at least one spouse needs to have lived in the county where the divorce petition is filed for at least the last three months. If, for example, you have just moved to California and wish to get a divorce, you will need to wait six months to file, and at least six months more months from the date of personal service before your divorce can be finalized. Do I need to go to court if my divorce is uncontested? One of the benefits of having an uncontested divorce in California is that you will usually be able to avoid appearing in court. In some cases, a judge may ask you to appear in court even with an uncontested divorce, but if you are trying to avoid court appearances, working with a good divorce attorney can help ensure that your divorce agreement is solid and your chances of going to court will be minimal. Do I need a divorce lawyer for an uncontested divorce? It is advised that those seeking a divorce consult with a divorce attorney during the divorce process. It is possible to minimize your contact with family lawyers if you would prefer to work through your divorce on your own. Consider divorce mediation as your alternative to a court appearance. Mediation allows you and your spouse or partner to work with a professional who is not necessarily an attorney to set the terms of your divorce. It is advised that you consult with a divorce lawyer outside of mediation with any questions, and prior to signing the divorce agreement. How do I determine the terms of my divorce without a judge? There are numerous ways to set the terms of a divorce agreement - all of them require approval by a judge - but not all of them need to be decided in a courtroom. However, setting the terms of your divorce in a courtroom may be a good option if you and your spouse have a high asset divorce with high emotions, or if domestic violence or abuse played a role in your relationship or your divorce. Alternative dispute resolution is an alternative way to set your divorce terms. Divorce mediation and collaborative law are the two most common forms of alternative dispute resolution, and each offers numerous benefits over a litigated divorce. You may also work with your spouse on your own; although it is recommended that you consult with an attorney as well. The uncontested divorce process starts with agreeing to the terms of your divorce - which is what makes your divorce uncontested in the first place. Your agreement will need to state that you both want to end the marriage or registered domestic partnership, it will need to divide all property and debts, it will make decisions about spousal support and child support, and it will have a child custody and visitation agreement. Child custody lawyers can provide you additional information on the process. One of the best things about uncontested divorces is that when the involved parties set their own divorce terms, they are more likely to both understand the terms and to follow them. Before you sign your divorce agreement, it is best to have an attorney look over the agreement. The attorney will help you make sure that you are not signing something that potentially hurts you, and that it follows California law. Working with a professional through divorce mediation or a collaborative divorce also allows you and your spouse or partner to make sure you understand all of the points you need to cover, how they could potentially play out in the future, and how the law affects your divorce agreement. If you reach a point during your uncontested divorce when you do not feel that you and your spouse will be able to come to an agreement within 30 days of being served, you may opt to file a response with the court, even if it means that your divorce will be contested. Once you have an agreement, you can file it with the court for approval by a judge. If the respondent did not file a response, this is up to the petitioner. There are numerous forms that will need to be filed, so it is best to have a lawyer work with you to make sure that you have the right forms, they are filled out correctly, and they are filled out completely. There may also be some local forms that are specific to your county, so make sure to ask your lawyer. If the respondent did file a response with the court, either party can file the final forms with the court. Once the judge approves your divorce agreement, you may have an additional form to file, called a Final Declaration of Disclosure. In some cases this is not necessary, so both parties should make sure to ask their divorce attorneys. Thinking of Hiring an Irvine or Santa Ana California Divorce Attorney? If you have questions about the uncontested divorce process in California, your best option is to ask a qualified divorce lawyer. 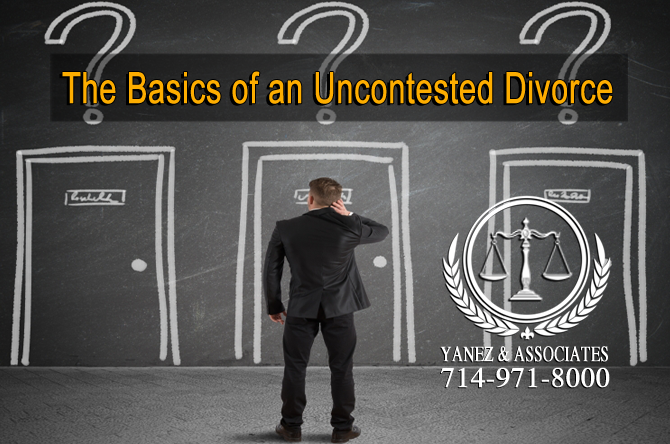 At Yanez & Associates, we offer free initial consultations so that you can get to know us, and we can get to know you and your divorce situation. Contact us today to schedule yours! 3.1 How long will an uncontested divorce take? 3.2 Do I need to go to court if my divorce is uncontested? 3.3 Do I need a divorce lawyer for an uncontested divorce? 3.4 How do I determine the terms of my divorce without a judge?